Sheila Roberts takes her readers back to Icicle Falls, Washington, for the eleventh and final novel in this popular series. Many of the women find it quite easy to identify their “ugly tree.” Pat has had difficulties with a grouchy landlord who is reluctant to make necessary repairs at her bookshop. Sierra Moreno, a divorcee who moved to Icicle Falls hoping to find a place where her special needs son could be happy, loves the small town—except for her curmudgeonly neighbor, Mr. Cratchett, the Scrooge of the community and the bane of her life. Olivia Clausen, whose family owns Icicle Creek Lodge, is delighted that her younger son Brandon is back in town and involved in the family business, but she finds her new daughter-in-law Meadow crass, crude, and hard to tolerate. Even Muriel, the perennial optimist, discovers that she may have a human “ugly tree” in her life. She is experiencing negative feelings toward one of her oldest friends. She has known Arnie Amundsen since they were children, and he has been her rock through the loss of two husbands. She loves him dearly, but she has never reciprocated Arnie’s romantic feelings. There is just no spark between them. Thus, when Arnie books a cruise to Germany as her Christmas gift, Muriel turns down the gift but suggests Dot Morrison accompany Arnie instead. But Muriel grows jealous of the friendship that develops between Arnie and Dot. Is Muriel being a dog in the manger, or have her feelings for Arnie changed? 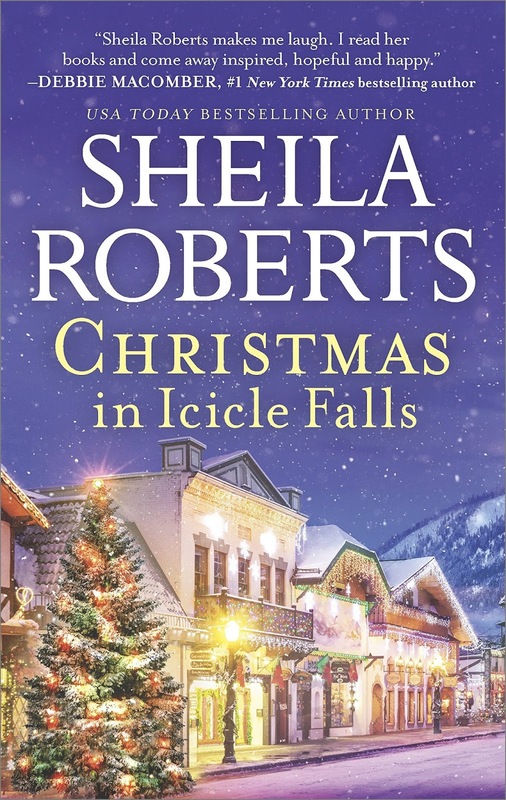 Christmas is the perfect time to visit Icicle Falls, and Roberts makes sure to give her readers the traditional sights, sounds, and smells of the holiday as well as visits with many of the Bavarian town’s favorite citizens. This book has the charm and the humor that have characterized the series throughout its five-year run. The “ugly tree” moral is not subtle, but it is credibly applied to the lives of these characters. And readers may find themselves asking if seasonal goodwill applied to their own “ugly trees” might produce changes as welcome as those that occur in Icicle Falls. The recipes at the end might add some extra cheer too. I’m considering the eggnog muffins myself. Life in Icicle Falls debuted in September 2012 with Better Than Chocolate. Readers who have followed the series will certainly want to include Christmas in Icicle Falls in their 2017 Christmas reading. Readers who love a good Christmas story with a full cast of characters and a message with the merriment can appreciate this story even if they are unfamiliar with the series. Some may find the moral a trifle heavy-handed, but I found the reminder to try a little kindness appropriate for our times as well as the holiday season. “Oh, Christmas tree, oh, Christmas tree. How lovely are your branches.” So the old song goes. But what if you bought a tree online that is anything but lovely? What then? Do you return it? Haul it to the dump? Complain? This is what happens to my character Muriel Sterling in CHRISTMAS IN ICICLE FALLS, the final installment in my LIFE IN ICICLE FALLS series. The tree that looked so lovely online doesn’t turn out to be so great once it arrives and she unpacks it. But Muriel decides to keep the mangy, little tree anyway and do her best to turn it into a thing of beauty. Lo and behold, the tale of Muriel’s ugly tree transformation gets her and some of her friends thinking and inspires them to apply the same principle to some of the people in their lives. This year, with the holidays right around the corner, I’ve determined to find the good in everyone… even those people who are “ugly trees.” In addition to decorating my house, I’m going to decorate my life and make sure my days sparkle with goodwill and kindness. Tis the season to be jolly, after all, and to deck the halls. And ugly trees. 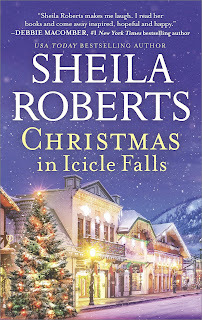 Many thanks to Janga for today's review and to Sheila Roberts for five years of intriguing characters and heartwarming stories in Icicle Falls. Do any of you have ugly tree stories? Were you able to turn your ugly tree into a Christmas beauty? I love Sheila's goal to make her days sparkle with goodwill and kindness. I can't think of a better way to spend the upcoming holidays! We always bought a real tree but this one year my husband was in the hospital. I was diagnosed with a neuromuscular disease. I went looking for a fake tree. They were all hideous. So we put up lights in the wall in the shape of a tree. The kids cut out ornaments, a star and a tree stump from construction paper. To this date the kids all say this was the best one. We had an old artificial tree that in it's last years was pretty ugly as we first put it up. Some of the limbs drooped so Dad had to tie them up to support them. The colors at the ends of the branches had faded. But by the time we got the lights, ornaments & garland on it became presentable for another year. We have always tried to get beautiful live trees. For the most part, we have been successful. One year, however, we decided to let our kids make the final decision. We were cutting our own that year and spent what seemed like forever tromping around in the snow looking at trees. Our daughter found one she just had to have and the others were ready to agree with her. It was too tall for the room and a bit sparse on one side. By this time, my husband was willing to take anything. We ended up having to cut off the top (crooked and odd branches) because the tree was too tall for the room. It took a bit to get it straight since one side had to be away from view because of the sparse branches. In spite of everything, it decorated up nicely. The kids loved it. I think in part because it was their tree and not the perfect one dad got every year. I've never had an ugly tree. When I was a kid, we always had real trees, but I can't remember if any of them were ugly.